We're talking about a large project of Buddhist sacred architecture rising up in the bushlands outside of Bendigo in Victoria, Australia. The Stupa will be the largest in the Western world, and its builders and designers have an ambitious and supremely long-lived approach. 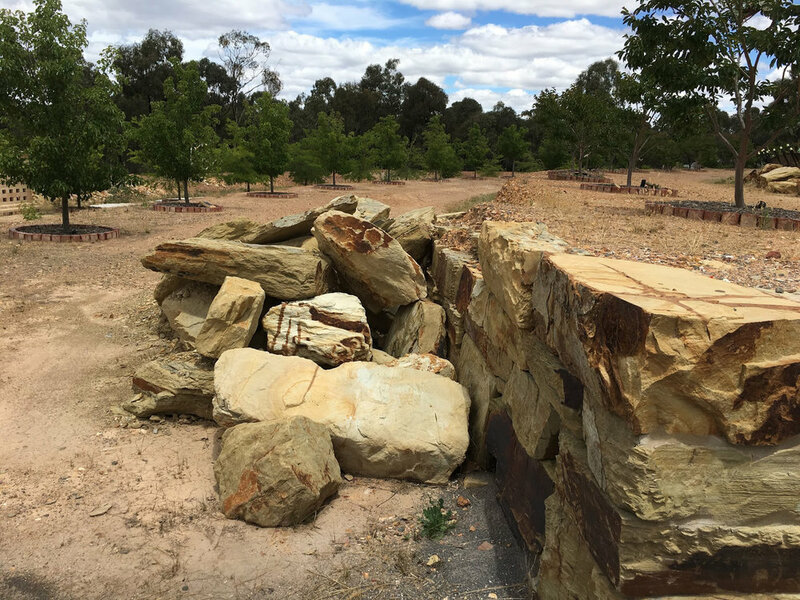 Ian Green, the founder of the project and upon whose land it is built, discusses the conceptual structure of this jaw-dropping sacred site appearing as a spacecreaft rising out of the dry Victorian scrub, and its community's sincere outreach to embrace all faiths and all peoples. 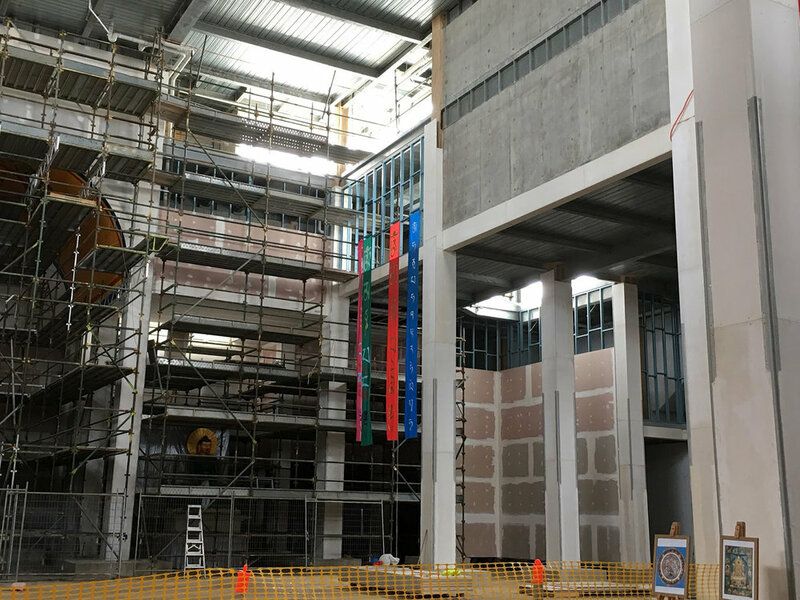 The Stupa will house holy relics and an interfaith library; a synagogue in Melbourne recently donated a 1,000 year old Torah scroll to its repository. The Stupa also doubles as a place of last resort by the CFA in case of bushfire. 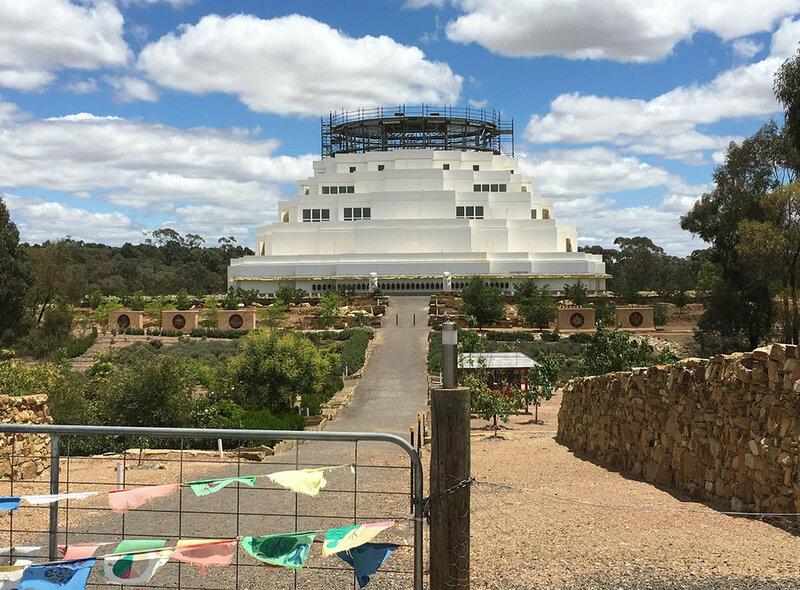 I have been visiting and photographing the Stupa of Universal Compassion since 2002 - through its growth from a just-cleared rocky platform to a rising symmetrical structure, changing at every visit. We can now imagine its decorative exterior, envisioned for the future. As the gardens take root, Tibetan and Australian artists paint ceiling decorations on scaffolding in the interior chambers. 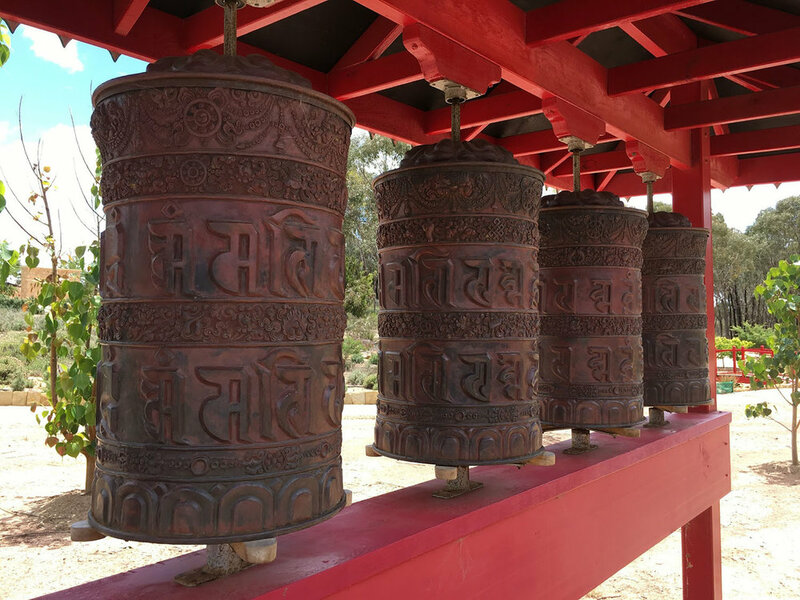 Giant cast bronze prayer wheels are commissioned and installed around the perimeter. Plans for the installation of the huge carved Jade Buddha for Universal Peace are taking shape for 2018. The Dalai Lama will preside over the installation of the Jade Buddha. The Stupa is built to last over a thousand years, and those building it expect the construction process to go well beyond our lifetimes. It is challenging to imagine an architecture of this time-scale arising in the "back blocks" of our local landscape. 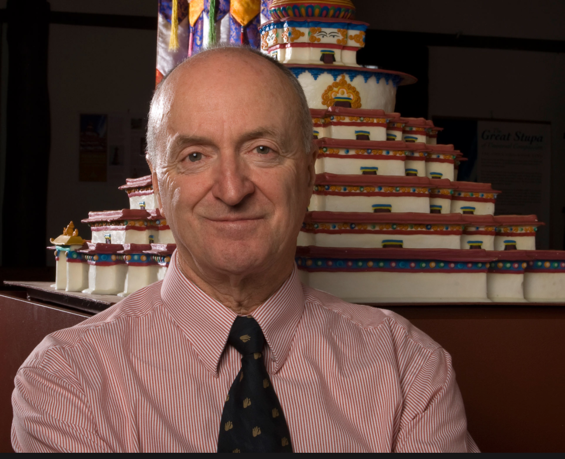 "According to Lama Zopa, he said basically that the building of the Stupa and just seeing the Stupa, even dreaming of it, even just reading a book or seeing a video of it is incredibly important because it plants the seed of enlightenment in the mind of all who see it." Ian: Well, at that stage when we first announced it, there was no centre here at all so the intention at that stage was to set up a Buddhist Centre. It didn't necessarily have a name even at that stage. 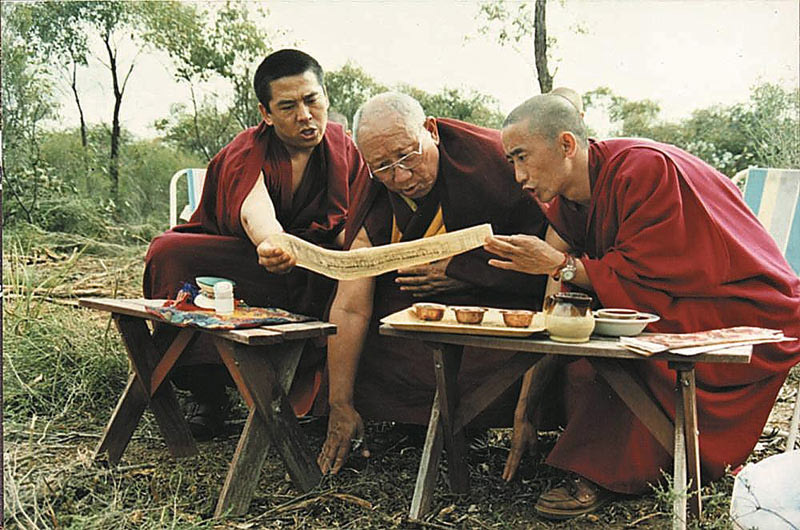 Then Lama Yeshe came here and identified it as Atisha Centre, and then talked about the Great Stupa, and then talked about the monastery, etc.. That's when he laid out the master plan in 1981. Ian: The vision of the whole thing, yeah. As it's gone along, we've sort of brought the community along with it to a degree and it's evolved ... It hasn't been something that's gone up overnight so I guess they've come to terms with it. (Talking about memorial sites for cremated ashes on the grounds of the Stupa) These aren't Buddhists, many of these people. Of course, they've got nothing to do with Buddhism, but they've decided this is a nice place to have mom, or dad, or whatever resting. I wouldn't know what the percentage is but I wouldn't be at all surprised if maybe 40% or something of memorials are not Buddhist here. In terms of visitors, we know that about 60% of our visitors are not Buddhist. They're tourists or people coming along to see what this strange place is. Ian: We're trying to be encouraging to interfaith dialogue as an important mission that His Holiness the Dalai Lama gave to us at the Great Stupa. The other thing he gave to us is this effort to improve the dialogue between science and Buddhism, and beyond that between all faiths and Buddhism and science as well. To that end, we've established a library which is now ... oh, I think we've got over 500 books and close to 1,000 books already, not all on science and faith but a big percentage of them are. We have now a group of librarians who are working on it and ultimately will become a very significant international resource I think for the study of Buddhist and science. Anyway, our overall organisation that we're part of is the foundation of the preservation of the Mahāyāna tradition. In that sense, we are preserving the Mahāyāna teachings, which originated in, or which were developed and preserved in Tibet. We're looking at preserving and continuing those. Yes, that's very true. That's what we intend to do and that's part of our mission as well of the whole organisation here including the monastery, and Atisha Centre, and the Stupa as well. 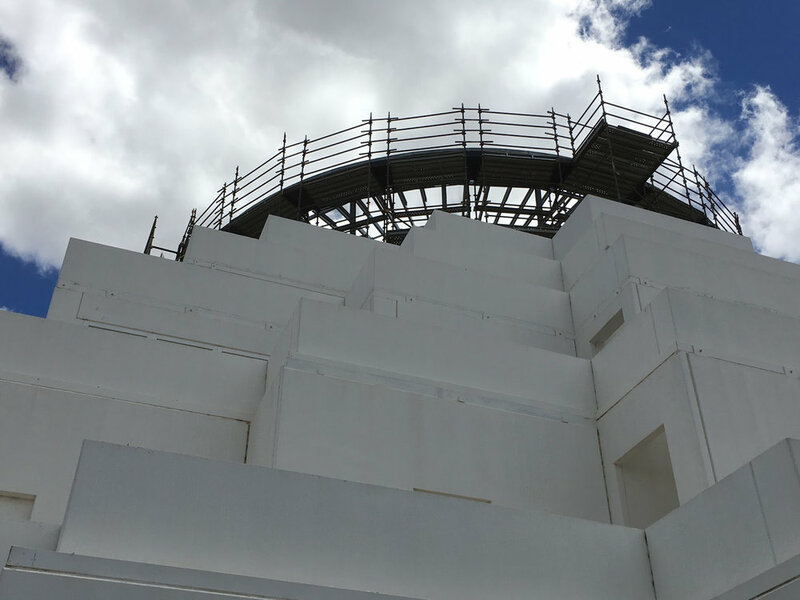 In a way, the vision I have for this place is that the Stupa is like if you imagine, like a very big funnel and the top of the funnel represents the Stupa where it's open to all faiths and to all beings. Then basically, if you want to go a bit further, you want to do some retreats, you want to learn how to meditate, you want to learn about Buddhist teachings, then you'd go to Atisha Centre. It's going to be less of them but the more interested. If you want to take it the next step and you want to become a monk or a nun or acquire that, then you get down to the bottom of the funnel where it's ... we're trying to present ourselves so that it's no matter what your level of interest, that we have the opportunity here for you. At that very broad level which is the ... represented by the Stupa, we're certainly very open to all faiths and to dialogue and to as I said, science, and Buddhism as well. Catherine: Of course, the Stupa is shaped like an inverse funnel with the narrow part at the top. Ian: Well, it is. That's true. Of course, the Stupa itself has ... I mean, there's also like a very symbolic aspect to the whole thing as well, which is to do with the function of the Stupa and the cosmology of the Stupa, and the fact that it's a repository for relics as well, and the fact that it symbolises the enlightened mind. According to Lama Zopa who's my main teacher at the moment, just to see a photograph of this Great Stupa or to see it in your dream is a blessing. It's like planting a seed to enlightenment. Whatever form your spiritual path takes is something that you will evolve, but its importance as a symbol and a visible sign is also incredibly important not just for Buddhist, and not just for members of other faiths, but for anyone with a faith or not. At the broadest level, we're aiming to be like a refuge of peace and also of a spiritual path here. Ian: Oh, very much so, yeah. Catherine: You can see the mandala gardens going in around there. Ian: Yes, there's reasons why we've chosen plants for each area as well and what they have. They will have a certain role as well in the overall path. In fact, as you enter the Stupa here, there's two big stone walls which you would have seen just at the entrance. The plan is that on running down one side of that will be one-and-a-half life-sized statues of the suffering of the human realm, the animal realm, the spirit realms, and even the whole realms. Basically, as you're going down, you're descending down the realm, the suffering realms of Samsara, and then when you hit the bottom of the peace park area, that's when you can spread out and there are many faiths represented there. There's Buddhist. At the moment we have Buddhist, we have Catholicism, we have the Seikh path, we have something from the Muslim, and the Hindu, and we're talking to Aboriginal people as well about it. Basically, you encounter the various spiritual paths at that stage and which is the foundation of the path. Then from there you climb up to the Stupa which is the symbol of enlightenment. The basis of Buddhism are the four noble truths, so the truth of suffering which is indicated by these statues you descend down, and then the reason for that which is basically our craving and so forth. Then the encountering of the spiritual path and then the path to enlightenment ... and to avoid, to overcome suffering but to attain an ongoing permanent happiness as well. Ian: Most people won't be aware of that, but there is the psychology behind the visit. Catherine: It's a conceptual structure that's incredibly powerful. Ian: It is, it is. 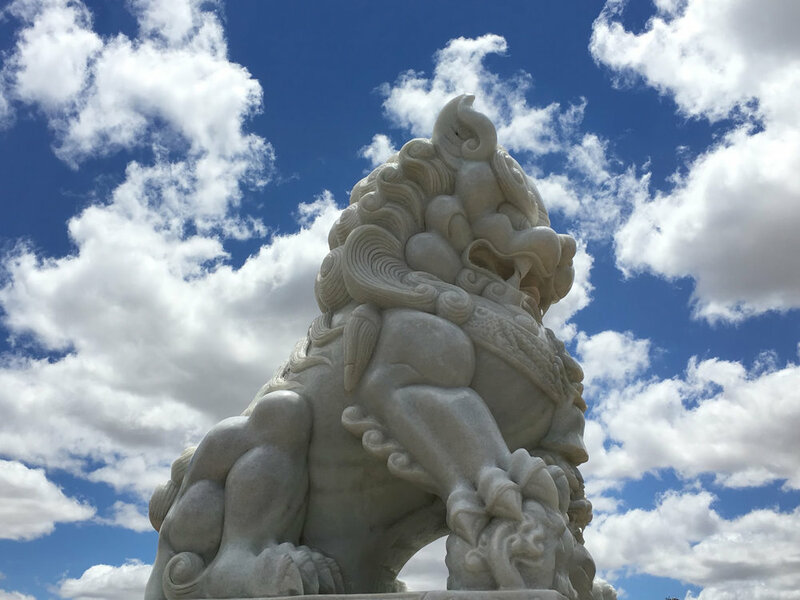 Then as you climb the Stupa, actually as you go from one level to another one to another one, you're actually rising up and getting to higher and higher levels of tantra. So until you get to the round level where the steel frame is now, which is where the holy relics are, which are the symbol of enlightenment as well. Even if you know what you're doing and you understand the symbology, then ascending the Stupa is also a meditation as well. Ian: Yes, you'll walk up. Ian: Spiral up, yeah. There are stairs going up so you can walk up in a clockwise direction, you can walk down in a clockwise direction as well. Catherine: They had a few tourists in, and his amazing ability to communicate the conceptual underpinnings and what that means in terms of the sort of multiplication of spiritual benefits, I would say from a lay person's point of view anyway. Catherine: When will that whole spiraling journey be available for somebody like us to come in... ? Ian: It won't be completed in my lifetime, I don't think. My main wish is that I can have the outside of it finished, and the inside of the main part finished. If I can do that by the time I die, then I'll be very happy. Ian: That will be the two primary things. Then as to each of the ... well, maybe that the sixth level probably be finished, hopefully, before I die as well because that's where all the holy relics will go, and we're actually going to start work on that in the next six to 12 months. That may well be done but the rooms between may not be completed. Catherine: You have a project that's really multiple lifetimes of work. Ian: Yes, it's a cathedral … in a sense that a cathedral ... well, I think now Gaudí's cathedral [La Sagrada Família] has been going for about say 150 years or a hundred and something years. It's still not 100% complete. It's sort of like 150 years is not that uncommon for a cathedral. Ian: It is a very long thing and that can be addressed on many levels. Even on an architectural and engineering level, it's very unusual, in fact, unheard of to have a building designed and made to last a thousand years. Most buildings have, I think, twenty years for most buildings it has to last. You can get out to fifty if you're getting really fussy about it, but to last that long is just such an unusual thing for people to come across these days, and it makes them, I think, address many issues about short-term, long-term, the benefits of different approaches. I think the other thing to say is that many people are like you. They've come on the journey. We started in 2000. Year 2000 we cleared the thing so already it's been going for like seventeen years. Many people come back every year or so and so that they're part of it, and that process will go on for their lives and maybe their children's lives. That means there's a big deal of ownership of it. Even if they can't come here, they're doing that on the Internet. They're following up around the world on the Internet. There's a big buy-in to the whole thing and also to talk about the funding of it because the funding is not being one or two people offering millions of dollars. It's more been like tens of thousands of people offering what they could afford, $10, $100, $50. Recently, I had a million dollar donation which was unheard of in the past seventeen years. Then, of course, we had the government offer as well. I guess it's a momentum thing as things get going. There's been an immense amount of people contribute to it as well and a part of it. I think the other thing I believe is that in a lot of our psyche is developed by the world we live in, and particularly in the West where we live in a country where spirituality really doesn't have much of a presence at all. If you rule out Gothic cathedrals and stuff like that which have a certain energy about them, there's very little spiritual symbolism in our society. The symbols we have are of commerce where we see shopping centres and big shopping strips, or big office blocks, or sporting arenas. If you just sort of looked with sort of new eyes at our society, this is what you'd be seeing. You'd be seeing lots of symbols which had been generated for the development of the economy and also commercialism, sport and competition, etc., and individual living. What I believe is that in our society what's missing - as in the whole thing, there's nothing wrong with all that- but the element that's really missing is spirituality. That's why I believe spiritual objects, whether they be big Stupas, or whether they be Buddha statues, or whether they be a mosque, or whatever it is, I think these are incredibly important in our culture because they have such a low profile or either seen as something in the history like old churches or they're just… there's nothing. I think by building things like this, we actually raise the whole profile in the collective consciousness in the West that this spirituality matters in our world. I think that's another very important sort of reason why we're doing it. According to Lama Zopa, really as he said basically that the building of the Stupa and just seeing the Stupa, even dreaming of it, even just reading a book or seeing a video of it is incredibly important because it plants the seed of enlightenment in the mind of all who see it. I think it also ... we know this from just reading Trip Advisor and whatever else that people come here and say, "Oh, just I love it here. It's so peaceful and I find it so inspiring." You just can read that from reviews in Trip Advisor. They're all incredibly positive. These aren't ... they're tourists basically. That's where reaching out to that broader appeal whereas if we were just offering Buddhist teaching, you'll get a few hundred, but with this, you'll get tens, maybe hundreds of thousands of people coming every year to see it. That way it has a broad impact on the society that we're living in. Catherine: Yeah, purposefully broad there. Catherine: With very long-term benefit designed in. Ian: Designed, exactly. That's right. Things like the presentation of peace and the importance of spirituality are part of the whole reason why we're building this. Catherine: Yeah. Thank you for your generosity. Yeah, and how amazing. I'll definitely write about the long time span and the broad reach - which is rare. How many people talk about that? Very few. Ian: Oh, no-one. Everyone that comes here just is like, "What?" Catherine: That is completely unique. 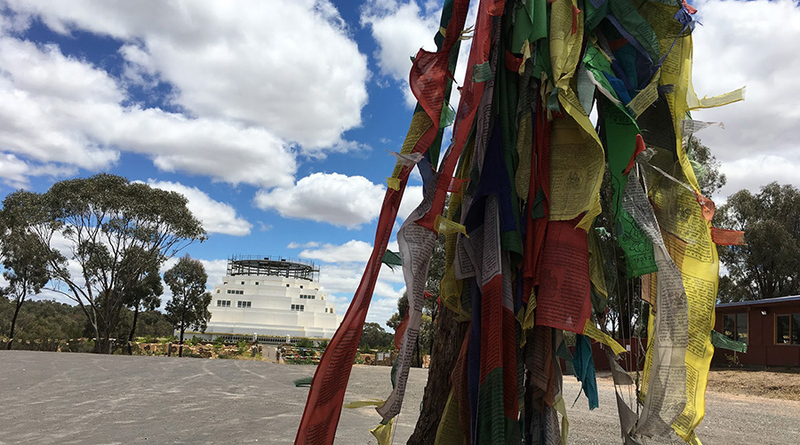 Catherine: I've been photographing the Stupa over several years - for this audience of people who are interested in worship, to read about architecture, and space, and time, and the conceptual dimensions… and even down to the impact on tourists. It's just so multifaceted. Ian: It is, it is. Then I think if you look at the broader context of this development here, so we have the monastery, we have the nunnery, we have a meditation centre. We also have like ninety homes that are going to be built here. A primary school is going to be built here, and an aged-care facility is going to be built here. Most people will just come to look at the Stupa but they'll see it in the context of where it's at and the context of what we're trying to present to people is that this is an example to everyone. It is available to everyone that visits it for of how to live in a peaceful cooperative manner, and how to live a sustainable manner as well, because our aim is that the whole site will be developed off the grid. We were generating it all from our own electricity and treating and re-treating all our own water and sewer as well. Catherine: Yeah, down to practicalities, real practicalities about living on the earth. Ian: Yeah, exactly. That's right. These are also long-term effects that we want to have as much as possible on the ... not on society. We're not just trying to influence just Buddhists or like a narrow group. We're trying to be a broad as we can. Therefore, in some ways we almost downplay the Buddhism aspect of it for visitors here. Most of them are interested so we tell them, but we certainly don't ... we try and project it in a broad sense. Catherine: Beautiful, and visionary of you and the founding Lamas. Ian: Yeah, I think so. I think so, yeah. Catherine: A lot of visionary work going on here. Yeah, well, thank you.